I put my mind to it and really went to town! And yes, I finished it. No, I’m not planning on doing a border. The top is finished! Here’s a short slide show of how I made this. I really think it is pretty self-explanatory. First I made 16 patches as I showed last time. I made lots and lots of them. In fact, in the end, I needed 516 of them! 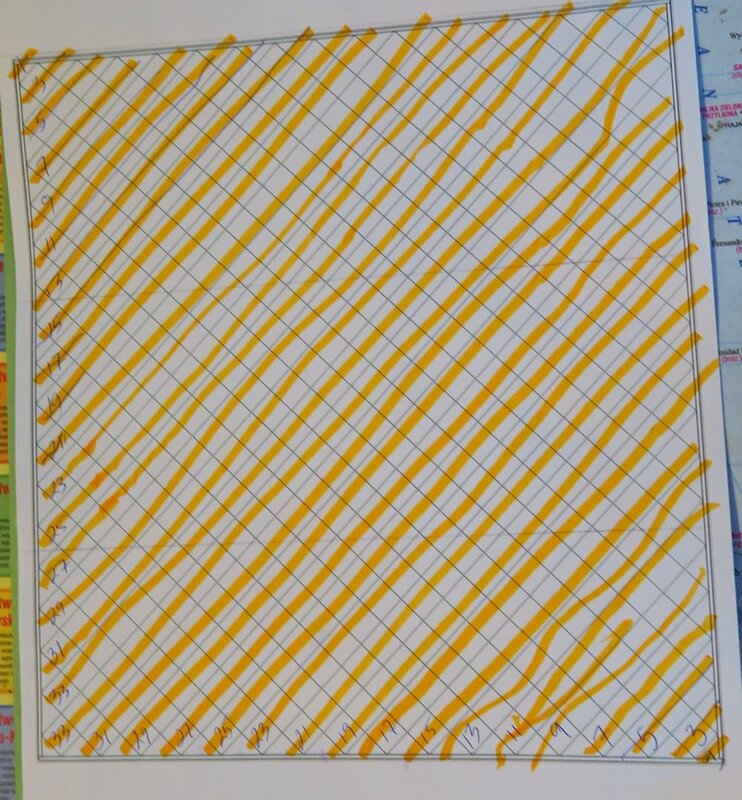 Oh, and for those of you who are “into” how many squares I had to make - that’s 8256 squares. However, because some of the squares were cut off when I trimmed the side setting triangles, there aren’t that many in the quilt itself. But that’s how many I made! Check out these pictures as I made the top - I took pictures every couple of rows that I finished! This way you could see progress as I advanced from a tiny little triangle to a whole queen size top! I trimmed off those little pointy edges with scissors after I sewed this piece to the rest of the top. If you right click on this and save it as a picture, you can print it out for yourself. I also found myself getting frustrated as I knew I wouldn’t remember how many I had done in each row, so I printed out this blank piece of paper with the layout on it and wrote beside it how many of those 16 patch checkerboards I needed. Then as I did them, I used the orange highlighter and marked them off - see below. This kept me motivated and encouraged. Yes, for me, it’s really that simple sometimes! One other trick I thought I might show you is this one - I put a safety pin in the top left corner so I would never get confused as to the direction I was working. This quilt top is about 91.5”x97” which is fine for me. It’s a tiny bit smaller than I’ve been making, but I thought it was “big enough” for me. for this one. Anyway…for now, this is how I made this top. If you think I should write up on officially as a pattern, I can do that. Let me know in the comments if you think I should. You can also tell me if you think these instructions are sufficient. I’ll read them all and consider them. And that’s what’s been happening in my sewing room lately!